﻿ Real Madrid 3-0 Sevilla. Great start of the year! 04.01.2017 » Real Madrid 3-0 Sevilla. Great start of the year! Real Madrid had an auspicious start of the year, beating Sevilla 3-0 at home in a Copa del Rey first leg tie. James Rodríguez scored a double while Raphael Varane found the back of the net from a header. The unbeaten streak will continue in 2017 and Real Madrid's last victim was Sevilla this Wednesday night. 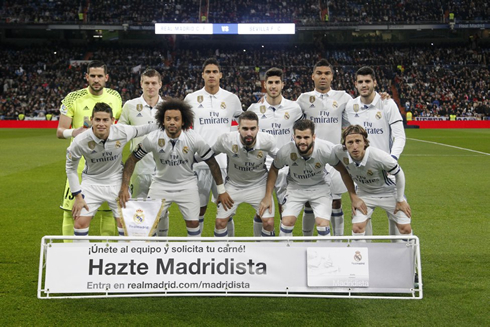 The Merengues dictated the law the Bernabéu in their first game of 2017 and ran through the Andalucian side in a clear 3-0 win, with 2 goals from James Rodríguez and one from Varane. Even though this was only the first leg for the last-16 round of the Copa del Rey and there's still a second game left to be played next week in Sevilla, it seems safe to afirm that Zinedine Zidane's men are virtually in the next round. Cristiano Ronaldo was given a rest in tonight's game and should be available to play next Saturday morning in Madrid's league game against Granada. It can always be a tricky time returning from the Winter break for teams previously on great form. It's hard to evaluate exactly how that form will carry over often and Madrid have previously seen specific seasons go awry during this period. One only has to look back to a couple years ago, when Carlo Ancelotti's side, on a 22-game winning streak at the time, fell apart in the new year. With the injuries piling up and some players, still perhaps in vacation mode, it wouldn't have been a massive surprise if the team struggled, especially against a formidable opponent like Sevilla. But Madrid came out firing tonight, putting the match, and possibly the entire leg behind them. With the likes of Navas, Ramos, Pepe, Bale, Benzema and Ronaldo out, Real Madrid fielded a changed lineup of Kiko Casilla, Marcelo, Daniel Carvajal, Raphael Varane, Nacho, T. Kroos, J. Rodríguez, L. Modric, Casemiro, Marco Asensio and Álvaro Morata. And... it worked to perfection. In fact, it may have been the best first half we've seen from the squad all season long. Real Madrid came out guns blazing, giving the Seville team all they could handle in the first half. Zidane, who has often been criticized for his apparent tactical nous, got things spot on today. From the opening minute Madrid pressed high up not giving Sevilla players space or time to get comfortable passing the ball. The first half an hour or so was vintage football. During that period, the Merengues found themselves two goals up. James, who according to reports was close to an exit this month, was on fire - scoring a nice goal early in the match. Raphael Varane would contribute as well with his well-placed header from a Toni Kroos corner kick. The German, celebrating his 27th birthday today, was spot on as usual with his delivery. James would notch his second goal later in the match from the penalty spot and Real Madrid would go into the half up 3-0. The second half wouldn't bring any more goals but the intensity would remain at the same level. In fact, it was likely the best and most complete performance we've seen from Madrid under Zidane, which is some statement considering all of his success. All 11 players could leave the field with their heads held high today, they represented the shirt well. Of course anything can happen in the second leg, but Madrid were dominant today and deserve all the plaudits. Attackers: Asensio, James Rodríguez, Morata. Cristiano Ronaldo next game is a La Liga fixture, on January 7 of 2017 against Granada. You can watch Juventus live stream, Real Madrid vs Granada, Athletic Bilbao vs Barcelona, West Ham vs Manchester City, Preston North End vs Arsenal, and Sutton United vs AFC Wimbledon, all matches provided from our sports stream game pages.